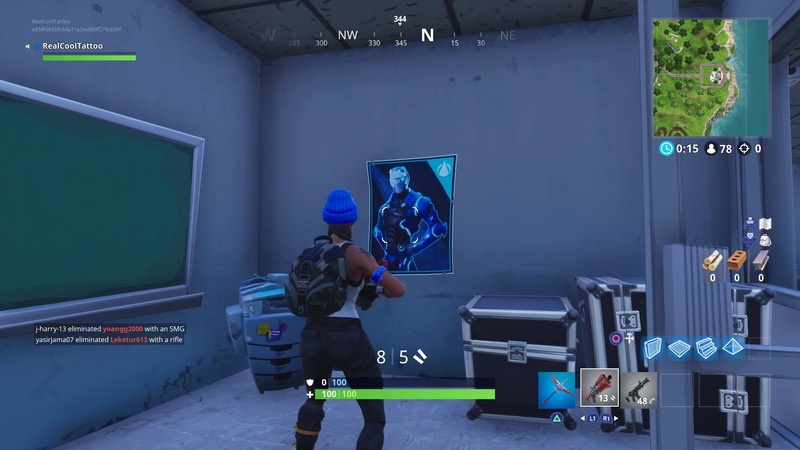 So you’re not lost in Moisty Mire for days, here’s how to spray over Carbide or Omega posters in Fortnite, with screenshots and locations for as many posters as you need to complete the challenge. You’ve only got a couple more days to complete this challenge, so get going. Fortnite Season 5 starts on Thursday will tons of new content. 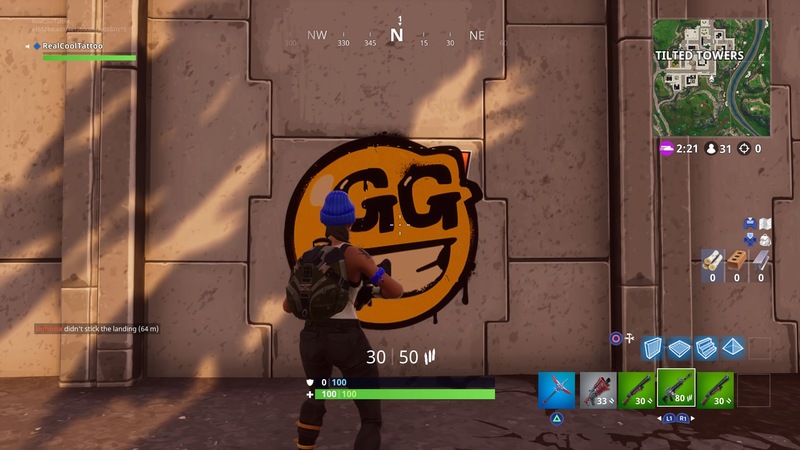 It seems like you can use any spray you like – we used the GG smiley from this season’s Battle Pass – and you don’t have to cover all of the poster for it to count towards your progress. One thing to note though: when we completed the challenge there was a bug that meant the challenge progress bar didn’t display in the top left of the screen like it’s supposed to – but if you’re spraying a poster, it’ll show up that you’ve done it after the match. You’ll have to spray over seven posters to complete to challenge. There’s an Omega poster just to the left of the bridge south of Shifty Shafts. Look for a wooden hut to the north of the bridge with some stairs under it. Go down these stairs and the poster will be on your left. 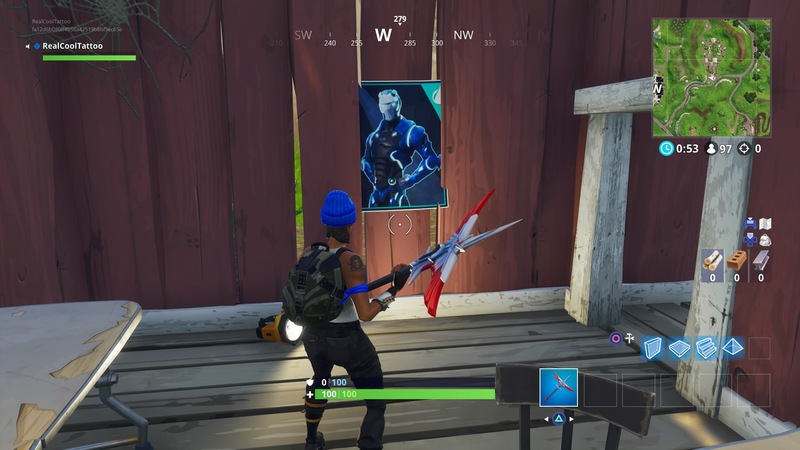 In the south east corner of Tilted Towers, at the bottom of the wall with the long set of metal stairs that leads up to Tilted, you’ll find another poster. 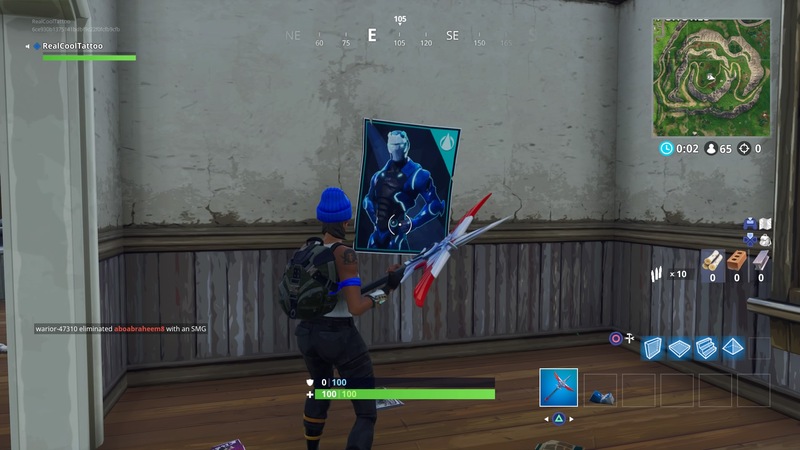 You can find another poster in the secret hero base that’s on the eastern side of the island. You can either glide into the base through the aircraft entrance outside to the east, or go through the house to above it. The poster is in the top left corner of the basement. On the road east of Retail Row you’ll find a wooden hut with an “OPEN” sign on it. Head inside and there’s a poster on the wall. North of Retail Row and southeast of Tomato Town there’s a small unnamed area with shipping containers. On the west side of this area, under an open building with a metal roof, you’ll find another poster. On top of the hill to the southeast of Snobby Shores, there’s a ruined house. Inside you’ll find a poster on the ground floor on the left of the room with the TV. The last poster you’ll need to complete the challenge is inside the house that’s in the centre of Loot Lake. It’s in the hallway on the ground floor, just next to the stairs. To the northeast of Wailing Woods, between map references I2 and J2, you’ll find a house. Inside there’s a poster on the ground floor living room next to the stairs. 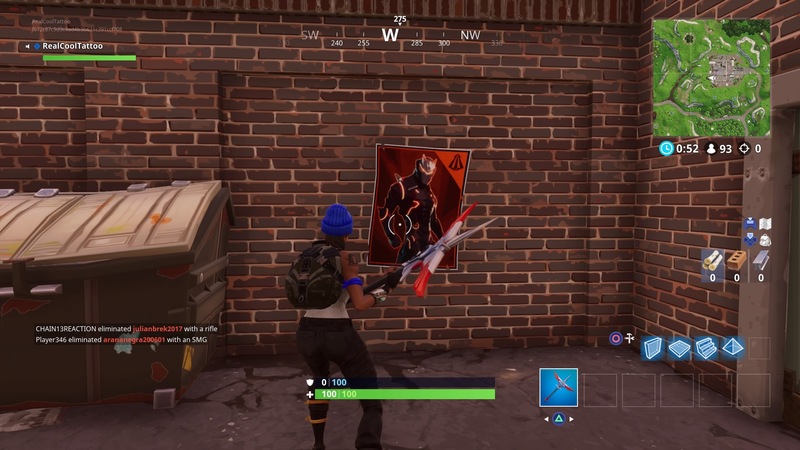 You can find a poster in the underpass south of Tomato Town. It’s in the middle, on the west side, next to a door with a “LEAVE” sign over it. On the northwest outskirts of Greasy Grove you’ll see a restaurant with a giant burger on top. On the west side of the restaurant, next to the chain-link fence, there’s a Carbide poster in the alleyway. There’s an unnamed motel area with lots of cars outside west of Anarchy Acres and northeast of Pleasant Park. 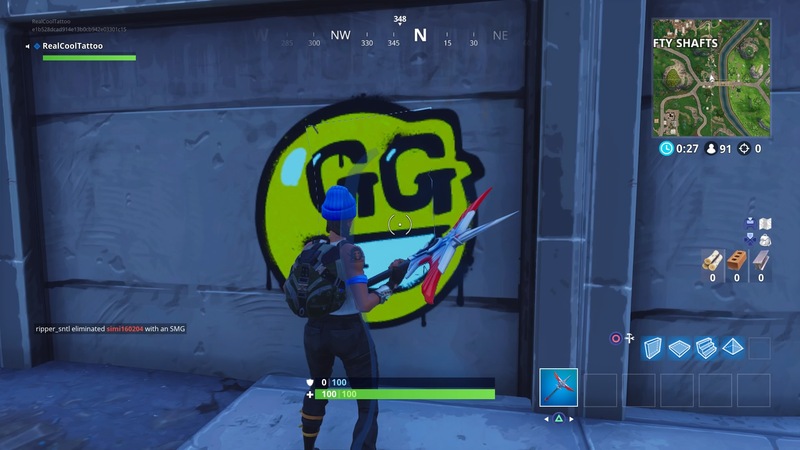 On the south side of the building here, go through the door and an Omega poster should be on your right. Southwest of pleasant park, there’s a single road that leads to a tall brick building. Go inside the building and on the ground floor you’ll find an Omega poster. To the southwest of Dusty Divot and north of Salty Springs, there’s a medium-sized mountain. Towards the south side of this mound, you’ll find another poster on the side of the rock. It’s next to a tent. If you were to land on the top and face south, you’ll have to drop down a bit and the poster should be on your left. In the centre of Junk Junction, there’s a large building on the right hand side. Go in and you’ll see a Carbide poster in a room with a big antique rug. In other Fortnite news, the latest patch gave a little love to an underappreciated equipment type in the game: traps. The new bouncer trap sends foes flying if they step on it. There’s cause for excitement with Nintendo fans too, with the Korean ratings board posting a rating for Fortnite on Nintendo Switch.